East Germany opens its borders to West Germany. In the late 1980s, East German communist leader Erich Honecker resisted Soviet leader Mikhail Gorbachev’s liberal reforms, which he viewed as subversive. In the summer of 1989, Honecker’s hard-line regime was overwhelmed by the wave of democratization sweeping across Eastern Europe. Reform-minded East Germans staged massive demonstrations, and thousands fled to the West through newly liberalized Hungary. In October, another hard-line communist, Egon Krenz, replaced Honecker, but it was too late to save communism in East Germany. On the evening of November 9, 1989, East Germany announced an easing of travel restrictions to the West, and thousands demanded passage though the Berlin Wall. Faced with a growing demonstration, East German border guards opened the borders. 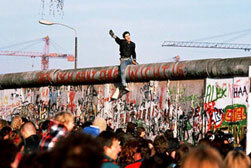 Jubilant Berliners climbed on top of the Berlin Wall, painted graffiti on it, and removed fragments as souvenirs. The fortified barrier–the most famous symbol of Cold War division–had split Berlin since 1961. In 1990, East and West Germany were officially reunited.